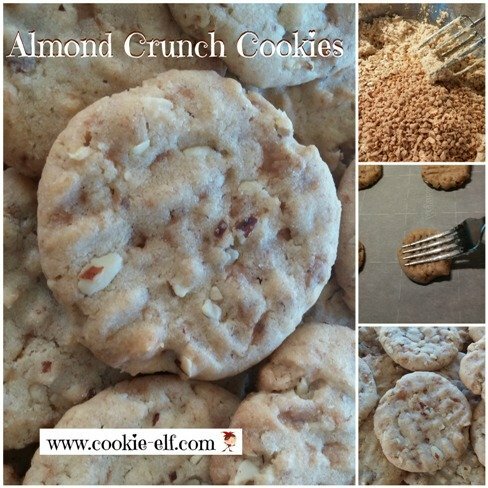 Almond Crunch Cookies are a unique cross between a molded cookie and a drop cookie. The dough is thick. That’s why the recipe calls for you to mold cookies into a ball and then use fork tines, dipped in sugar, to flatten the cookies. This way the cookie will bake all the way through before the outside browns too much. Yet these cookies are shaped much like a drop cookie. In fact, you can drop tablespoonfuls of dough onto the baking sheet and then flatten them, if you prefer – the shape may simply be not as perfectly round. Almonds, almond flavoring, and toffee bits add up to a warm, buttery, nutty flavor. The cookies taste like individual toffee-flavored shortbreads. It’s easy to see why these cookies were a favorite recipe from the iconic Pillsbury Bake-Off Contest #30 in 1982. In a medium bowl, combine flours, baking soda, salt, and cream of tartar. Set aside. In a separate bowl, cream together butter, oil, and sugars together until pale and fluffy. Add eggs, one at a time, beating until the mixture is smooth. Mix in almond extract, scraping the bowl continually, combining thoroughly. Gradually add flour mixture to creamed mixture, adding a bit at a time and mixing until smooth. Stir in chopped almonds and toffee bits. Mold large tablespoonfuls of dough onto balls. Roll balls in granulated sugar. Place balls 2 inches apart on prepared baking sheet. Dip a fork into sugar; press tines over cookie balls in a crisscross pattern, one at a time, to flatten each cookie. Bake cookies for 12-16 minutes until golden brown around the edges. Remove baking sheets from the oven. Let cookies cool for a minute on baking sheets before using a spatula to remove them from the sheet to a cooling rack. To coarsely chop almonds, start with sliced almonds. Measure 2 cups. Place sliced almonds in a food processor and pulse on high several times until nuts are chopped. You can make Almond Crunch Cookies as large (1/4 cup of dough) or as small (a tablespoon of dough) as you like. Adjust baking times accordingly.